Connecting the Dots for Your Interior Design. Styling. Staging. Sourcing. Events Your home should be a reflection of you, your family and your experiences. Designed for how you live and entertain. It should speak to your unique personality while being grounded in timeless furnishings that can evolve with you. Restaurants & Retail spaces need to inspire, to invite you in and make you want to stay a while. I have worked in retail, in showrooms, I have owned restaurants. I know how important work zones, traffic flow and multi-experience approach is to welcoming and keeping your guest coming back again and again. My job is to help you determine how you will use your space, guide you in determining your unique design esthetic and then help you connect all the dots necessary to bring your vision to life. The AHA Collective is a full service design firm based in Chapel Hill, NC specializing in making life easier and more enjoyable through smart inspired design. Services Provided Art Selection, Attic Conversion, Basement Design, Bathroom Design, Bedroom Design, Color Consulting, Custom Bathroom Vanities, Custom Blinds & Shades, Custom Fireplace Mantels, Custom Furniture, Custom Rugs, Dining Room Design, Entry Design, Floor Plans, Furniture Selection, Holiday Decorating, Home Office Design, Home Theater Design, Interior Design, Kids Bedroom Design, Kitchen Design, Kitchen Remodeling, Laundry Room Design, Lighting Design, Living Room Design, Mudroom Design, Nursery Design, Playroom Design, Space Planning, Sunroom Design & Construction Areas Served Chapel Hill, Durham, Raleigh, Pittsboro, High Point, Greensboro, Winston Salem, Hyco Lake, Lake Gaston, Boothbay Harbor, ME . . . you name it. Full service design firm with boutique showroom in Dunn, NC. We can help you plan and implement your project whether big or small from start to finish. Our designers, Robbie Tart and Sarah Pope will plan your remodeling job or assist with plans for new construction. Our showroom has all types of flooring, fabrics, furniture, lamps, art, accessories, and more! We are located in the newly revitalized Downtown Dunn just 40 minutes from Raleigh. The main goal of a merchandiser is to listen, observe, understand, empathize and finally, make the invisible visible. I can make things fresh and new, elevating the clients’ products, increasing both sales and foot traffic. As an expert in the merchandising field, I have logged over 10,000 hours and 30 years of retail experience creating dynamic store designs, new store installs, holiday sets, window displays, kiosks, departments and visual displays. I look forward to meeting and opening a dialog with you about your individual needs and vision. 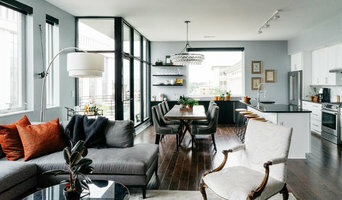 ABOUT US: The Warehouse is a unique Interior Design Firm providing retail sales, and houses Raleigh Designer’s Resource. It is co owned by interior designers Liles Dunnigan and Zandy Gammons. The Warehouse opened its doors in 2013 to provide something missing in Raleigh. It is a multi functional interior design business that specializes in creating beautiful and functional residential and commercial interiors. They have both spent years mastering the ability to create interiors that are both aesthetically pleasing but also meet the specific needs of each client. They have recently added Raleigh Designer’s Resource to their store which is open th the public for boutique fabrics, wallcoverings, and flooring. RDR provides many sources for textiles that are currently unavailable in N.C.
Meg Chenery Interior Design is a full- service design studio specializing in custom residential design. Based in Raleigh NC the firm is headed by principal designer Meg Chenery, a North Carolina native. Basing each project on the individual needs and desires of her clients, Meg gives careful attention to each detail to ensure an end result that will reflect your individual spirit & exceed your expectations. Whether your project involves new construction, a renovation or a simple transformation of one room, Meg makes the process fun and enjoyable – as it should be! Re-design Services: provides for the rearranging of existing furnishings to update the overall look of the decor. Furnishings: Village Design Group maintains hundreds of accounts from high-quality furniture lines to suit any decorating style. Remodeling & Renovation: Our services can include minor projects such as removing a wall, to installing new flooring, to complete remodeling of kitchens and bathrooms. Construction Oversight: Building a home can be a challenge. Stay on schedule, manage your budget and enjoy the home of your dreams with our construction oversight service. Consultations: Our designers meet the needs and respect the budgets of clients. We offer an inspiring showroom, professional services and a relaxing atmosphere. 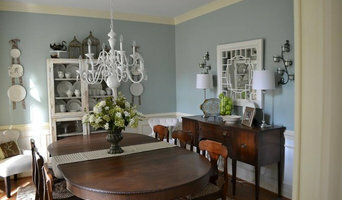 Luxury residential decorating studio serving the metropolitan Raleigh area. Blue Soho Design specializes in creating distinctive, expressive and lifestyle-enhancing spaces. Owner is a visual artist, filmmaker and painter. Motto: BEAUTY, FUNCTION, LIFESTYLE. 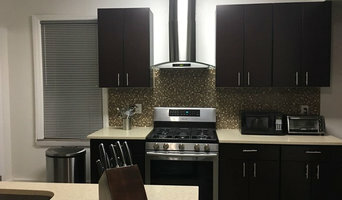 We are a design firm that has over 25 years in the construction and design industry in Las Vegas and that has the unique design style that combines years of international materials and design styles. We work in North Carolina and Las Vegas and bring the mix of styles and bring your style to life. 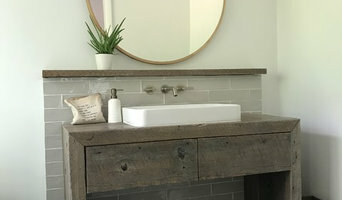 Allison & Co is a Residential Interior Design studio based in Raleigh, NC. The Styled Space helps you create beautiful rooms for real life through reusing pieces you already have, redesigning the space with new additions to ultimately allow you to rediscover a room that you love!